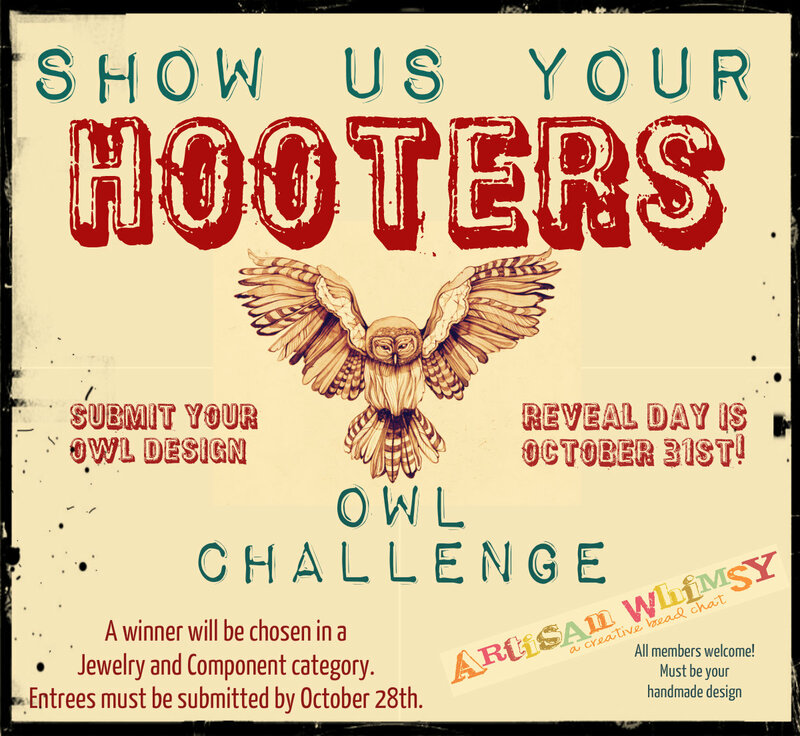 When I heard about this hooters challenge, I just knew I had to participate - and get your minds out of the gutter: hooters as in owls! 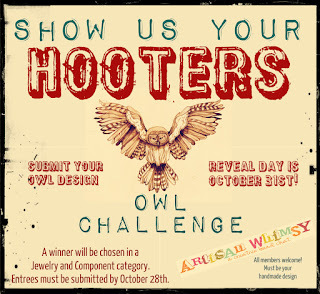 They're hosting a Hooters Owl Challenge at Artisan Whimsy and the rules are pretty simple. Any Artisan Whimsy member can participate in one or both categories: jewelry and components. Submissions must be your own personal design and be handmade. Oh, and the most important part - must contain an owl! Now I ask you, what goes with owl better than macrame? I started my owl with a crystal slider piece and used knotting and seed beads to make his body. And then I was stuck. How to hang him? I debated for quite some time and took suggestions. I considered a spiral macrame cord but decided it would be too much of a good thing. Ribbon would be too simple, as would plain chain. Strung beads are just not my style. I finally decided on a fairly simple bead and chain combination. A little random. A bit eclectic. I tried photographing this guy three different times before I finally got some pictures I thought were good enough. The mix of black and silver and brass actually has a fair amount of color, but it is hard to capture. I even tried hanging him in a tree (stop laughing - owls hang out in trees, don't they?). Beautiful , both original idea and jewel!! Sherri, I just love how playful and original this guy is, while still so elegant! Your creativity impresses me as much as your awesome skills! Cute, cute, cute. What a fun piece. You are so creative~ I really love the brass and silver mixed with the black. YOU have my vote! This is truly an original! Beautiful owl - Love this!! Very cute .. and yes I voted! Good pictures really counted as there are way too many thumbnails to open them all! There really are some cool pieces there, don't you think? I found several component pieces I'd really love to have! I love him and I voted! Good luck and may the best hooters win! Sherri - you are currently leading the pack and I'm so tickled. Great Hooters here! Good luck with the voting. Such a cute and clever (wise) owl!